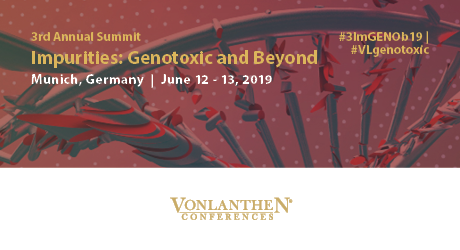 We are pleased to invite you to the 3rd Annual Impurities: Genotoxic and Beyond Summit scheduled for June 12th-13th, 2019. This premier B2B event provides the appropriate platform to engage and discuss ideas with your peers, while facilitating a professional atmosphere and environment for good company representation and development. The Summit will shed light on the compliant implementation practice of ICH M7 and Q3D and novel strategies for efficient mutagenic and elemental impurities identification and control. It is an honour and privilege to invite you to participate in this Summit. We look forward to welcoming you in June!